Renault, with its soon-to-launch Lodgy, is looking to capture a considerable chunk of the promising MPV segment. The carmaker had previously hit the jackpot with its Duster range, and if it hopes to repeat that kind of success, the Lodgy will have to dethrone the segment leader – the Toyota Innova. On paper, the Lodgy looks very promising, with just the right ingredients to take the fight to the Innova. Here's how the two heavyweights stack up. 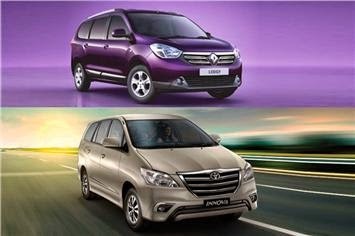 Both the Renault Lodgy and Toyota Innova come only in diesel guise. The engine in the Lodgy is available in two states of tune (83.8bhp and 108.5bhp), but for this comparison we'll consider the more powerful version. Although the Lodgy has the smaller engine, it makes 8bhp and 5kgm of torque more that the Innova. While the 8bhp power advantage may not seem like much, it's the 5kgm more torque that makes the difference. People movers like these two here are generally used to carry quite a load of people or luggage, and in that case, more torque is always better. The Lodgy also gets an extra gear over the Innova (mated to the 108.5bhp motor) and the sixth gear could imply the Renault is better suited to cruising on the highway and returning better fuel economy than the Toyota. MPVs are all about practicality and space; lots of space. Talking purely of dimensions, the Lodgy has a wheelbase that is slightly longer than the Innova’s, but it's the Japanese car that has the advantage in terms of overall length; and although not too much, in terms of width and height as well. So, while legroom could be a bit of an edge in the Renault, the Toyota is likely to be more comfortable for taller people. Both MPVs are well equipped and in the top spec avatars, boast features like AC vents for all three rows, USB, aux-in and Bluetooth connectivity, touchscreen, rear-view camera and rear parking sensors. In terms of safety, both get ABS and dual airbags. Where Toyota does well is to provide airbags even on the base trim. So, Renault seem to have quite the capable people mover to take the fight to the Toyota Innova. What would work crucially, is the pricing. Now while the Innova is priced at Rs 12.54 - 15.81 lakh (ex-showroom, Delhi), the Renault Lodgy is likely to come priced in the range of Rs 9-13 lakh (estimated, ex-showroom, Delhi). If Renault plays its cards right, it may just have another Duster-like success story on its hands. Very nice article about Toyota Innova car.If anybody needs to Buy Toyota Innova Tyres Online please visit Tyreonwheels.